When someone escapes an attack from Sun Ce, he can compete with them. If he wins he can choose two other player and they are attacked by Sun Ce. 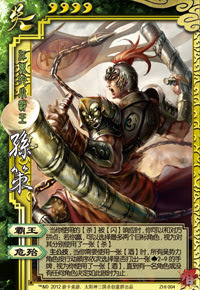 King Ability: When Sun Ce needs wine, he can ask other members of Wu to discard a two to nine of spades. If any member does, Sun Ce is given wine. "Overlord" can be used to create a cycle, but Sun Ce must compete each time. "Grave Danger" can be use when Sun Ce is on the brink of death.